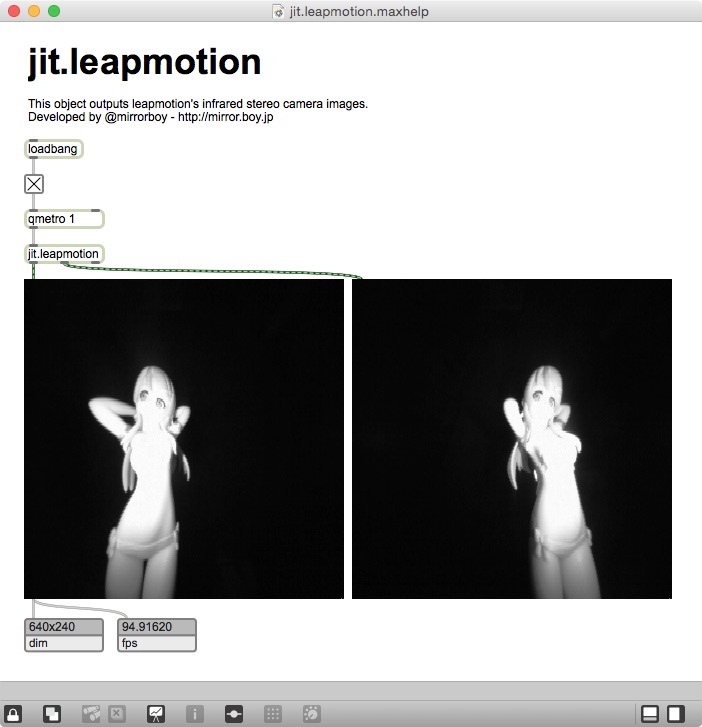 Before using this object, You should check "Allow Images" on Leap Motion control panel. Yeah! I was waiting for someone to implement this in Jitter. Great job! Do this require a specific version of the Leap Motion software? I'm currently running v2.1.5+22699 on OS X 10.10, and using your example patch just outputs a black jit.pwindow. The jit.fpsgui objects are updating with correct information about the output, but I'm just not getting any visuals. Unplugging the Leap results in a "Leapmotion is not connected" message in the Max window, so it's finding the Leap at least. Works for me on 10.9. Have you checked "Allow Images" in Leap Motion settings? Can this be used simultaneously with getting normal leap inputs via another object? LSKA - that was the issue. I totally missed that part of the post. Thanks! Nice! You've re-ignited my interest in my somewhat-neglected Leap..
p.s. would you release the source? I use Mac so this is great, but a Windows version would be great for a project I'm working on. Are there technical reasons why this can't be ported to PC or does it just need someone with the relevant knowhow to take a look?